Looking for a yummy recipe idea to use apples? Well I have one that after you try it, you will wanting to make it all the time! It is a Irish Apple Cake recipe. 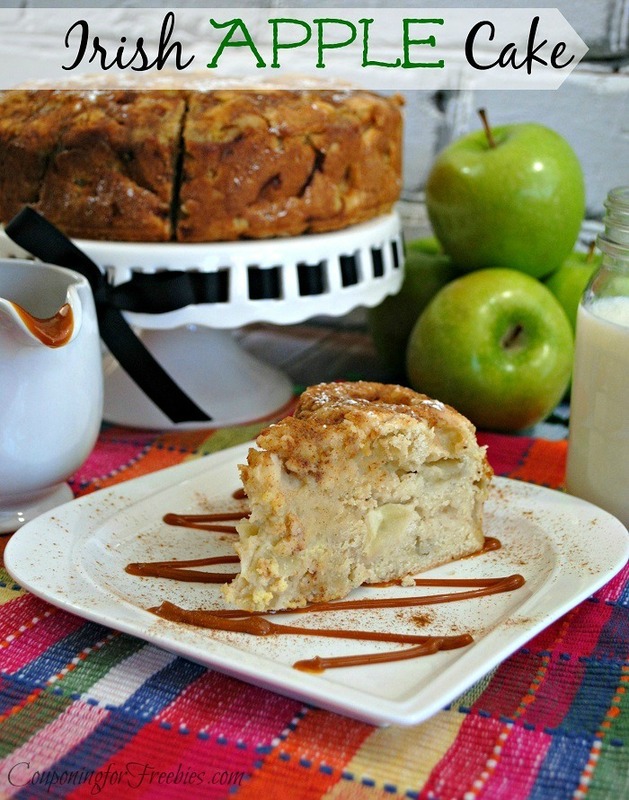 Not only is this Irish apple cake pretty easy to make, it is super yummy! Most of the ingredients you will already have in your kitchen too. I love when a recipe uses mostly things I already have. Saves me from having to do a lot of shopping. You will need a 9 inch springform pan to make this cake. -Butter and flour a 9-inch spring form pan then set aside. -In a large mixing bowl whisk together the flour, baking powder, salt, ginger, nutmeg and allspice for about 20 seconds. -Add the cut butter pieces and rub them into the mixture using your fingertips until it looks like fine crumbs. – Stir in 1 C sugar. -Peel apples, slice in half, core and stem, layer apples on flat side, slice downward into pieces less than 1/4 inch thick. -Dice the apple pieces into smaller chunks ( about 2 or 3 chunks per slice). – Add the diced apples to the flour mixture. – Toss well to evenly coat, work to separate any apples that have stuck together. – In another bowl, whisk the milk, eggs and vanilla together until they are well combined. – Pour the milk mixture over the apple and flour mixture. – Wash your hands next then just toss until combined. Your batter will be slightly lumpy but that is okay …..just don’t over mix. – Pour your batter into the prepared baking dish, spreading into an even layer. – In a small stir 2 Tbsp sugar plus 1/2 tsp cinnamon to sprinkle evenly over the cake. – Bake the cake in a preheated oven 45-50 minutes until a toothpick inserted into center comes out clean. – Now cool the cake for about 5 minutes on a wire rack. – Remove the ring from the spring form pan allowing the cake to cool to your desired temperature.